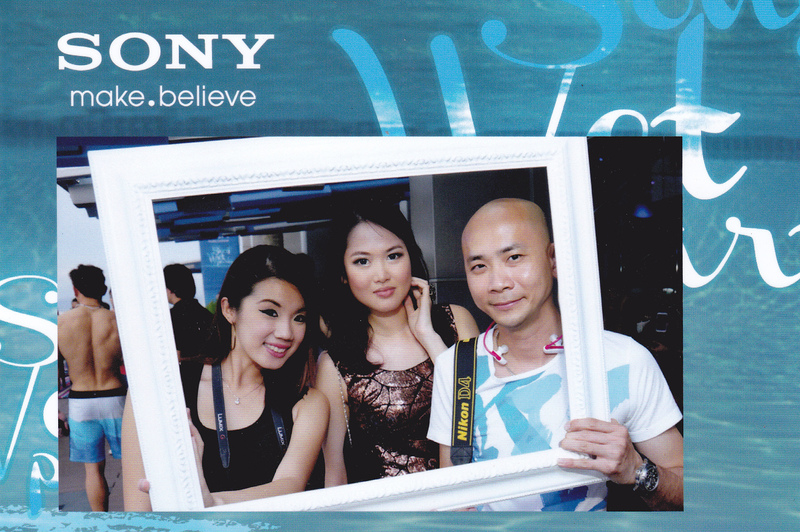 To celebrate the launch of the new Sony Walkman Sports MP3 Player, Sony Malaysia threw a “Wet Party” at the Aloft Hotel, KL Sentral. You might remember my post on Mai Bar, Aloft KL from not long ago where there is a lovely infinity pool. Well, that pool was definitely well utilized during this event. 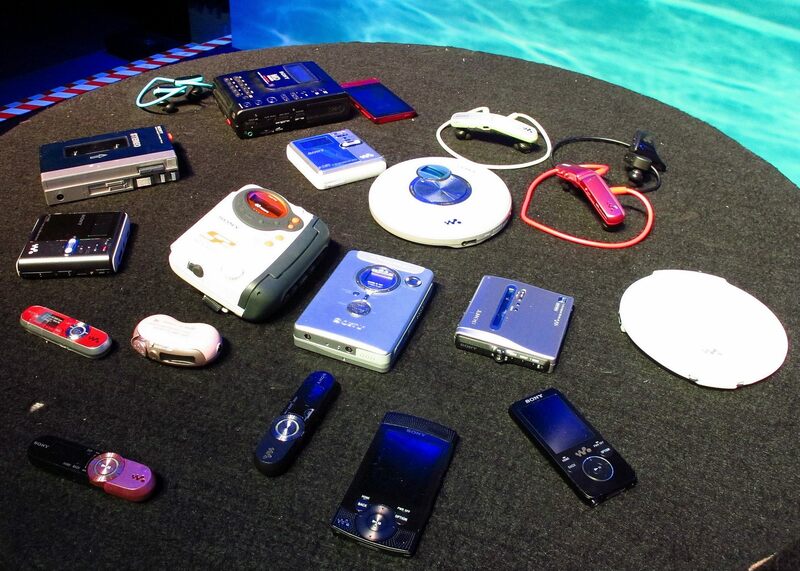 What does a MP3 Player has to do with a pool, you might wonder. This ain’t no ordinary MP3 player, my friend. For the first time, Sony has designed a device that is also waterproof, thus taking it out of the comfort zone of your bed, gym, training track; plunging straight into your bathtub (well for the lazy ones like me) and swimming pool. Though don’t start bringing it to dive with you as it only tolerates up to 2m of water depth. So Louise you can abandon your genius idea of letting the fish listen to your music. Mai Bar’s gorgeous Infinity Pool. 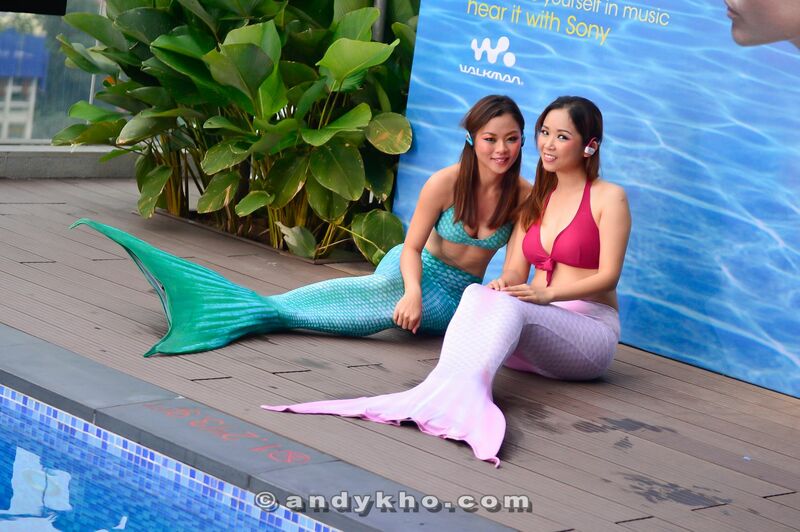 But what really grabbed our attention were these mermaids. We were eagerly waiting for them to jump into the pool (they did). It must have been rather difficult to swim in that outfit though. So cute, right? You can see that they are wearing the Sony MP3 Players. The evolution of entertainment devices over the last few decades. We were also fascinated by the display of the various Sony music devices, as old as 1979 (the cassette walkman on the top left). How many of these do you own? With MHB’s Jiayeen and Andy Kho. Gold Medalists of the recent ASEAN games. I guess since I mentioned the hunky dudes, I must have a picture to prove right? Bit more on the new NWZ-W273 device: It is designed with intuitive controls to easily adjust volume to play, pause, or change songs on-the-go. It has a rather large (4GB) on-board memory (approximately 1000 songs), users can easily drag and drop DRM-free music files and playlists from iTunes® for Mac or PC, Windows® Media Player, or Windows Explorer. In terms of battery life, the NWZ-W273 delivers up to eight hours of audio playback on a full charge. Here’s another exciting feature: if you are the type of person who forgets to charge your devices until the last minute, you can just charge it for 3 minutes, and it will last for up to 60 minutes. Sony has always been known to provide extraordinary audio performance, and the NWZ-W273 player is no exception, with its crystal clear highs and deep bass. The design of the tension band provides a supportive and comfortable fit, perfect for any sports activities. There’s no slowing down when you exercise with this device without the worries of the earpieces falling off, and they come with small, medium and large sizes. 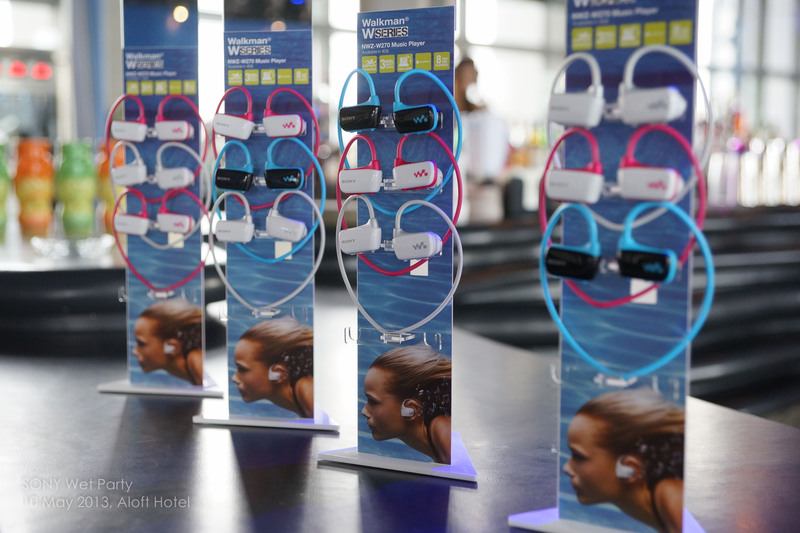 Available in blue, pink, white and black, the NWZ-W273 player is priced at RM299 (SRP) in Malaysia, coming to a store near you. Wow!!!! Sexayyyyy!!!! Hmmm…I thought I would get to see you in your wet t-shirt. Hehehehehehe!!!!! I want a mermaid tail! if only you can bring one down for diving.. heheheh. Yeah that would be pretty cool. Maybe in the future! Yeap! Perfect for you then.